‘Cerberus’ Manfern spotted in Tasmania’s Northwest! 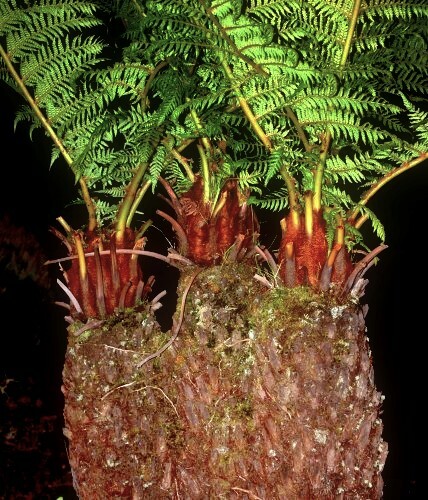 A three-headed manfern (Dicksonia antarctica) found in Northwest Tasmania! Of all places, it was found growing as a cultivated specimen at the carpark of Bischoff Hotel, Waratah, Northwest Tasmania. This 1.5m or so tall monstrosity of a manfern reminded me of Cerberus of Greek and Roman mythology, the monster usually depicted with three heads which guards the gates of Hades. Plants like tree ferns usually tend to be single trunked as they only have a single growing axis, pretty much like the majority of palm species. Multiple crowned specimens are commonplace, most often resulting from where several sporelings have grown together with the same vigour. Now I look forward to seeing a ‘hydra’ manfern! 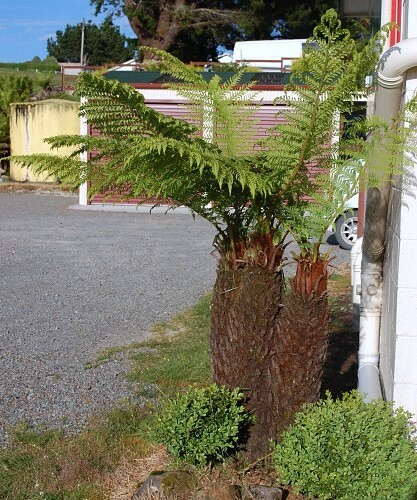 This entry was posted in Botanical Oddities, Ferns and tagged Bischoff Hotel, Cerberus, Dicksonia antarctica, Dicksoniaceae, multiple crowned tree ferns, northwest Tasmania, soft treefern, tree ferns, Waratah. Bookmark the permalink.